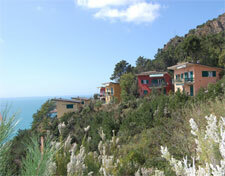 The Village is situated along Ligurian Eastern Riviera, in a 15 hectares' protected area rich in pine-trees and mediterranean maquis (an average of 800 sq.m. for each guest and a sea coast of 1 km). The microclimatic features of La Francesca are due to its favourable position facing South and protected from the North winds. Medium temperatures, in fact, during the coldest months seldom fall below 10� and weather is dry and sunny for most of the year and windy in Summer. La Francesca is a self-sufficient settlement, where you can spend your time with no hurry or constraint. Tourists, who nowadays are more and more desirous to discover landscapes, scents and natural flavours, find in La Francesca the ideal place for a stay in all seasons.